The Quick and the Dead, a film starring Gene Hackman, Sharon Stone, Leonardo DiCaprio and Russell Crowe, directed by Sam Raimi, was produced between November, 1993 and February, 1994. I, the creator of this site, played an often-seen but non-speaking character (the ex-Confederate outlaw). Having worked on The Quick and the Dead almost every day of production, I literally lived this movie. The Set - The town of Redemption. The Director - Sam Raimi. The Stars - Working with the likes of Gene Hackman, Sharon Stone, Russell Crowe and Leonardo DiCaprio. The Special Effects - Rain, explosions, etc. The Firearms - And the people who brandish them. The Crew - The technical support people. The Townspeople - The Good, the Bad and the Ugly: the extras. The Councillors - Herod's Henchmen. The Day of the Dead Festival - Redemption's Big Holiday. My Part in It - Photos of myself on set (ones not seen elsewhere in this site). The Day-By-Day Account of the 57 days I spent in Redemption, from the journal I kept. A Typical Daily Call Sheet - From Dec. 9, 1993 (large image files may take a while to load). Where to find me in the movie - Frame captures in widescreen format, courtesy of (and many thanks to) Alicia White. Other stuff which was cut from, or not used in, the movie. Misc. Movie Notes - As I keep remembering stuff. Newspaper Articles - From the local Tucson paper. 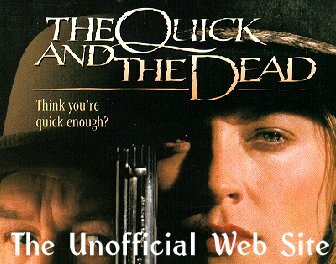 Links to sites related to The Quick and the Dead, Sam Raimi, Bruce Campbell, etc. FAQ - Answers to Frequently Asked Questions about the movie, this web site and me.